Looking for an ATV sprayer or UTV sprayer? 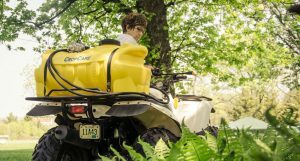 CropCare’s 12 volt sprayers are built to last under heavy-duty uses, whether our 25 gallon ATV sprayer or 40 & 60 gallon all-terrain sprayers that can be purchased with a 3pt Hitch configuration, Pull-Type, or UTV bed. For larger Ag sprayers visit CropCare’s website.